The importance of mangrove forests – for food, carbon storage and sequestration, coastal protection, and even tourism and water purification – is widely acknowledged. So much so that there is an increasing drive not only to halt further losses, but to increase mangroves through restoration. Dr. T.A. Worthington discusses how IUCN and The Nature Conservancy (TNC) are building tools to support this momentum. IUCN and The Nature Conservancy (TNC) are helping channel this increased momentum by building key knowledge products and tools that can help restoration practitioners determine where and how to restore degraded mangroves. With support of the BMUB-IKI funded “Forest Ecosystem Rehabilitation Project,” IUCN and TNC are developing a global map of mangrove restoration potential as a means to support and encourage the growing interest in restoration. This work, led by Tom Worthington (University of Cambridge) and Mark Spalding (TNC) will use earth observation data, including information on the current and former extent of mangrove forests; maps and models of the causes of mangrove loss; and data on the physical and social constraints to restoration. As a framework within which to map restoration potential, it is important to know the current and historic distribution of mangrove forests. Existing information on mangroves is limited in that it either provides a snapshot of extent or covers only limited geographical areas. However, current research, such as that undertaken by Global Mangrove Watch, aims to provide mangrove extent at multiple time points from the mid-1990s to the present day. This time series of mangrove extent will allow us to identify areas of recent mangrove loss, with the assumption that recently converted areas are more restorable than those that were lost long ago. To be more effective, the map will incorporate to the extent possible, the many local drivers of mangrove degradation (e.g., urbanisation and industrial development, conversion to agriculture and aquaculture ponds, deforestation for fuelwood or timber, altered freshwater regimes, pollution and coastal erosion), which vary in extent and severity between countries and regions. Identifying what an area of mangrove has been replaced with gives an indication on the feasibility of restoring that area. For example, large areas of mangrove, particularly in Southeast Asia, have been converted to ponds for shrimp aquaculture. Initially these ponds are highly productive, providing income for local communities; however, over time the economic return often declines and many are abandoned. These abandoned shrimp ponds have been highlighted as major opportunities for mangrove restoration. A number of additional environmental and social factors further influence the suitability for restoration. While data on physical constraints such as wave energy, tides and bathymetry are only available at coarse spatial scales, this information can give a broad indication whether an area is suitable. 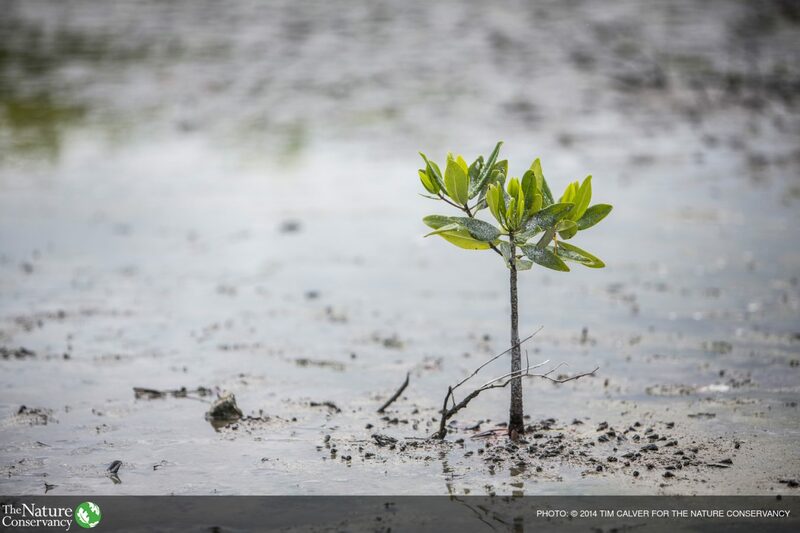 Incorporating data on population density, demographics, wealth, and use of the mangrove-derived products, the project aims to produce a more complete picture of the factors driving restoration potential. The combination of these factors provides an idea of the current conditions; yet threats to mangroves are not static. The project will also incorporate projections of future sea-level, hurricanes and urbanisation to highlight those areas where restoration may not be viable in the long run. While a map alone cannot drive change, it is a valuable tool that can be used by environmental groups and decision makers to show the extent of degraded mangroves, how much land is available for restoration, identify where these areas are located, and kick start opportunities for implementing restoration projects. While the cost of mangrove restoration can be relatively low at the site level, scaling this up to achieve ambitious development goals will require high levels of investment; understanding that there are competing needs for government and charitable funding. While tough decisions always have to be made, mangroves provide multiple goods and services for people, fostering healthy and sustainable communities. The end-point of this project will be to visualise these values of mangroves on the map of restoration potential. Good models now exist, and more are under development, which will enable the maps to show not only where we could restore mangroves, but what the potential return on restoration investment might be for specific ecosystems services. The project will show the modelled values for potential mangrove areas for services such as fisheries enhancement, wave attenuation, and carbon storage and sequestration. Mangroves are rightly held up as the poster child for ecosystem service value. By highlighting the long-term value of mangroves this work should reach far beyond the conservation sector, encouraging the engagement of governments and local communities and providing critical new impetus for future restoration. Dr. T.A. Worthington is a Research Associate, Conservation Science Group, Dept. Zoology, University of Cambridge, Cambridge (UK).